Published on Brewtopia's November 29 Brewsletter. Years ago, I realized that the beer that I wanted, was not the beer that I was drinking. While I had enjoyed my time with the typical American light lager titans, I knew that there had to be something better. Sitting at the bar of The Globe in Athens, Georgia, I stared at a selection of unfamiliar bottles and asked the bartender if they had anything from Belgium. From the selection came a tall dark vessel that was opened by a cork instead of a cap. “This one’s called Chimay Grande Reserve,” the bartender advised, “and it’s brewed by Trappist monks!” As the bartender poured this dark carbonated beverage into a glass goblet of all things; I already recognized that there would be no going back. Since that first taste of Belgian beer I have been searching for anything to which it can compare. I fell in love with American beer and everything that it brings to the table… which is just about everything! My girlfriend and I like to travel whenever possible, and we often plan around our favorite breweries so that we can stop by to learn their history, take in their process, and enjoy the beer. 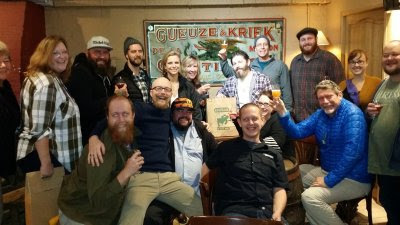 When we stumbled across Owen Ogletree’s Brewtopia newsletter and found that there were spots available for a trip to Belgium, we quickly jumped on board. After years of homebrewing, brewery tours, beer festivals, and thousands of tasting flights, I was finally headed to the source of my obsession. This trip was truly the pinnacle of my beer exploration. From the massive commercial brewery of Duvel, to the smallest brewery in Belgium (Interpol), we learned where these unique and incredible tastes were born. Outside of creating and hosting the Classic City Brew Fest and Atlanta Cask Ale Tasting, Owen is devoted to teaching all who are interested in learning about beer. 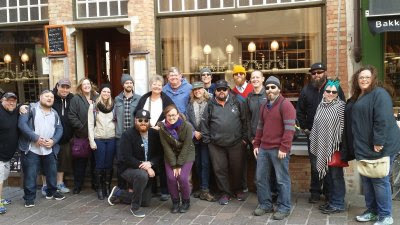 Owen and his many friends in Belgium provided our group with behind-the-scenes tours, rare tastings, and a wealth of knowledge. Achouffe Brewery - The Achouffe Brewery stood unique from the rest with a single caveat: gnomes! From the tiny chairs in the brewing rooms to the mushrooms around the pond, we found these little sprites and related paraphernalia all over the pristine, green grounds. The brewery boasts that the gnomes are the reason for the taste behind the beer, and I would have trouble arguing that the complexity found in their classic Belgian styles weren’t produced from something outside of the normal. Hommelhof - a three-course beer lunch with some of the best beer gastronomy imaginable. Owen’s friend Stefaan paired excellent beer selections from the area with some of the best food, to create a meal fit for royalty. Brewery Interpol - A good ways away from the fast-paced city of Brussels, we went to meet Pol and his wife Tine. These two run a comfortable looking B&B and the smallest brewery in Belgium! Pol (Inter-Pol get it?) took us around their brewery where we tried each of their astonishingly delicious brews. Stepping outside into the sun and watching the beautifully green countryside while sipping good beer with good friends definitely made me want to pack up my things back home and join this heavenly setting. Westvleteren's Café - Visiting the grounds of the grotto at St. Sixtus Abbey was a captivating precursor to the beer at Westvleteren's Café in De Vrede. The Westvleteren 12 might just be the best Belgian quadrupel I have ever tasted! The beers are almost impossible to get anywhere else in the world, so I was extremely excited when we were able to snag a few to take home! 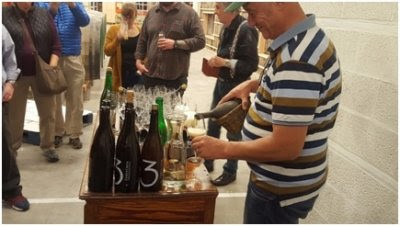 De Cam – I loved the tasting and personal tour of De Cam’s lambic blending facility from the enthusiastic Master Blender, Karel. 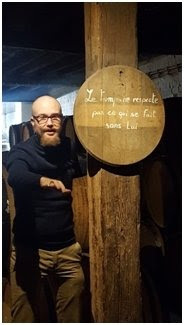 He taught us everything we could want to know about real lambic blending - from the history of De Cam’s location to the specifics of lambic fermentation. As this was one of the first stops in the trip, it certainly set the pace for the exciting week ahead. Karel ended the tour by playing his Flanders bagpipes! Cantillon Brewery - When our trip started, I may have been one of the only members who wasn’t already familiar with this famous lambic brewery; but by the time we visited, I already felt like an expert. Several floors, filled with barrels layered in history were shown to us by our animated guide, Cedric Jamar. While our group was already prepared for what we expected to be one of the highlights of our trip, Cedric broke through our expectations and proved that these brews had even more depth than imaginable. While we lined up to take home a few of these rare bottles, we drank in the taste of “real” lambics and experienced what a passionate process can produce. Orval Ruins and Tavern - Orval’s Cistercian ruins were more picturesque than anyone could imagine. 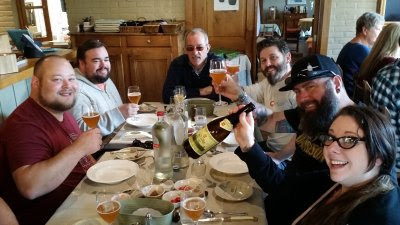 While still caught in a haze of awe from viewing the ruins, we tasted the Trappist table beer which can only be found at the A l'Ange Gardien Orval Tavern. While enjoying this incredible beer, we also spoke with the general director of Orval, Philippe Henroz. Bruges - With a short walk from our bus, we reached the historic town of Bruges. With age-old buildings, this place took me straight into a period movie. As we visited breweries and pubs that were hidden around every corner and in every alleyway, I am forced to compress the entire town into one top ten item. I could have spent months walking around the canals and chocolate shops trying to find every good pub in the area and still come up short. 3 Fonteinen - Visiting 3 Fonteinen and meeting owner and master blender Armand DeBelder as the last stop of our scheduled week must have been strategically planned, as it would be impossible to leave this visit without experiencing the feeling of a renewed and revitalized perspective on Belgian beer. Armand takes passion and his love for blending to an unthinkable level that encompasses everyone around him. Despite only visiting Armand for a short period, we all felt as if we were sharing astounding beer with a longtime friend. Belgian Beer - In every brewery, blending facility, abbey, and beer enthusiast in Belgium, a common theme was present: time. While the United States is quickly becoming one of the beer centers of the world with its innovative experimentation and incredible array of hop varieties, Belgium has been focusing on the same styles that they have always done, and are continuing to do it better than anyone else. Much of the beer that I tasted in Belgium stood out as having an overall complexity that was astounding. From the quadruples brewed by Trappist monks, to the lambics produced in the same methods for hundreds of years; Belgian beers will forever exude the tastes that all others wish to aspire.